Cryosauna gives health and beauty, increases working efficiency, improves emotional state. Just 3 minutes - and you are full of energy and buoyancy, feel a surge of energy , and your mood is great! It is mighty good, if you can use this wonderful procedure at home, when you soul wants and you body demands it. Today Cryotech gives such opportunity to you using new and high technological development of the German specialists. 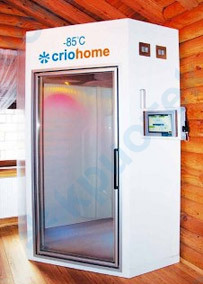 Criohome - is the modern air cryosauna of European standard level. It could be mounted in the gym hall or SPA area in the country house. The bathrooms are long already not only the auxiliary premises, but the whole complexes with thought-out design and well equipped technically. Today the bathroom is a place for health improvement and rest, and frequently it looks like the smart interior, amazing imagination with shine and luxury. Many people consider, that well-being, mood and even business depends from comfort which meets us in the bathroom at the morning. Cryosauna will become remarkable stylish addition to the equipment in such bathroom, quite meeting requirements of beauty, comfort and practicability. Being combined with the common design harmoniously, the cryosauna will be suitable for the premises of modern style ideally. Besides various color variety of the cabins allows easily to adapt the cryosauna practically to any interior. Healthy way of life becomes more and more attractive, therefore the owners of many houses consider that it is necessary to provide special premises for sport activity. The cryosauna could not have come at a better time in the home gym room. If you are tired and don`t want to practice with the home gyms and fitness trainers, it is high time to take the cryosauna. The three-minute procedure restores power tone and gives charge of vivacity allowing to carry out habitual training with full feedback and always be in the excellent physical form. Nobody is already surprised with various fitness simulators today, but the air cryosauna can become original highlight of your home sport center attracting attention of your friends and familiars. But certainly it is not the main thing. The main thing is that the cryosauna in the home gym room will help to make sport activity pleasant and effective.